This paper investigates the ability of connectionist models to explain consumer behavior, focusing on the feedforward neural network model, and explores the possibility of expanding the theoretical framework of the Behavioral Perspective Model to incorporate connectionist constructs. Numerous neural network models of varying complexity are developed to predict consumer loyalty as a crucial aspect of consumer behavior. Their performance is compared with the more traditional logistic regression model and it is found that neural networks offer consistent advantage over logistic regression in the prediction of consumer loyalty. Independently determined Utilitarian and Informational Reinforcement variables are shown to make a noticeable contribution to the explanation of consumer choice. The potential of connectionist models for predicting and explaining consumer behavior is discussed and routes for future research are suggested to investigate the predictive and explanatory capacity of connectionist models, such as neural network models, and for the integration of these into consumer behavior analysis within the theoretical framework of the Behavioral Perspective Model. This research has been supported by the Economic and Social Research Council and by the Marketing and Strategy section at Cardiff University Business School. Following the work of Skinner, operant conditioning has been defined as behavior that is controlled by its consequences, and employs a method of training with Reinforcement that follows a particular schedule. Any procedure that delivers reinforcers following a specific rule could be defined as a Reinforcement schedule. 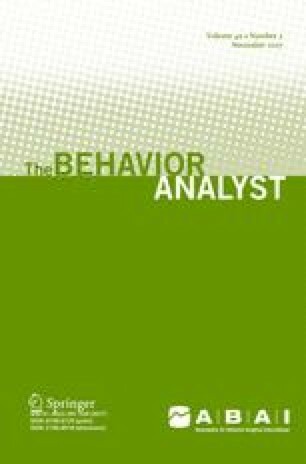 When speaking of any reinforced behavior, an integral part of the analysis is the suggestion of a Reinforcement schedule through which behavior is maintained over time. In a laboratory setting, it is possible for an investigator to control the schedules while response patterns are examined. In operant conditioning, typical Reinforcement schedules are fixed interval (FI) and fixed ratio (FR), and variable interval (VI) and variable ratio (VR). Under FI schedules, Reinforcement is presented every n th period of time; and after every n th response under FR schedules. Under VI schedules, Reinforcement is presented on average every n th amount of time. Under VR schedules, the number of responses required for Reinforcement varies in each trial. In the real world however, it is rarely possible to classify complex, social, human behavior maintenance according to any definitive schedule. As a result, buying and consumption behavior research rarely follows any strictly-enforced schedule in the experimental laboratory sense. The unit of analysis is also defined using a much broader scope or on a much broader scale, including not only the instance of purchase or consumption, but also pre-purchase and post-purchase responses (Foxall, 1990, 2009). Consumer behaviors can be classified into four overarching operant classes: accomplishment, pleasure hedonism, accumulation, and maintenance (Fig. 5). Behaviors classified as accomplishment are maintained by high Utilitarian and Informational levels of Reinforcement and may include behaviors such as acquisition and conspicuous consumption of status symbols and activities that seek sensation and excitement. Behaviors classified as hedonism are characterized by high Utilitarian and low Informational levels of Reinforcement and are usually positively reinforced by popular entertainment or negatively reinforced by behaviors such as taking analgesics. Behaviors classified as accumulation may include collecting and saving (such as loyalty programs) and are maintained by high Informational and low Utilitarian Reinforcement. Behaviors classified as maintenance are necessary to sustain one’s social and physiological being and include fulfillment of duties to the society characterized by low levels of Utilitarian and Informational Reinforcement. Several interesting patterns can be derived from the examination of these categories. A general relationship between Reinforcement and setting could be suggested: behavior setting influence declines as Reinforcement variables influence increases, maintaining behavior on high variable schedules. A more detailed discussion and interpretation of the four operant classes and contingency categories can be found in Foxall (2010).